I’ve written extensively on the subject, but I wanted to throw out this little reminder (with a true story to reinforce the idea). Mercury, ruling transportation and communication, tends to throw those things off kilter when in retrograde (3 times a year). My oldest daughter was traveling from Syracuse, New York to Phoenix for a visit this past weekend. She went stand-by because we have airline employees in the family. We normally take measures to avoid delays with detailed planning. This time, it didn’t work. It could also be coincidence that Mercury began its triannual backward motion in the sky 4 days prior to her vacation. My daughter and 2-year-old granddaughter made the first leg of their trip to Philadelphia. There wasn’t enough room for her husband, so he caught the next flight out of Syracuse. In Philly, they were repeatedly bumped from flights for other priority standby or paying passengers. We tried re-routing them through Vegas expecting them to get out on the last flight from Vegas to Phoenix that evening. They ended up stuck in Vegas for the night – with a toddler. The following morning, they showed up for the flights to Phoenix. They sat at each gate while four flights passed them up with no extra room on board. Finally, there was a single seat available on the the next-to-last flight out. My son-in-law took it so my daughter and granddaughter would stay together. My daughter was distraught over the prospect of spending the night in the airport. Luckily, my daughter and granddaughter did make it to Phoenix on the last flight out of Vegas. It was a relief for all of us when we finally met up at the airport. Their exhaustion was palpable as they passed through security. Oh, one thing I forgot to mention? My granddaughter, Poet, is a sensitive being. She immediately becomes physically ill when stressed. Not only were they dealing with missing flights, but Poet was throwing up the entire time. If you know toddlers, you know they don’t normally give you the heads up when everything’s about to come up. Often they, and/or everybody/thing around them gets covered in vomit. THAT is what they were dealing with on this nightmare trip. They also arrived just in time for 122 degree heat. Great vacation, huh? 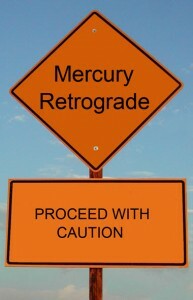 Mercury in astrology, mercury planet, Mercury retrograde. Bookmark.